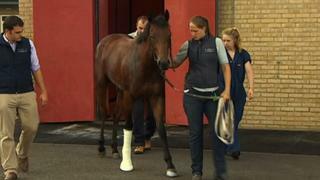 BBC Look East reporter Louise Hubball is given exclusive access to the Newmarket Equine Hospital for a behind-the-scenes look at how the facility treats injured horses. Watch as a two-year-old thoroughbred is put on to the operating table for surgery on a leg fracture - the biggest threat to racehorses. Nearby, scientists use stem cell research to identify which racehorses are genetically prone to leg fractures.